Rings for Men | Gemstone Jewellery from Rocks & Co.
You just have to search for ‘#men’s rings’, on Instagram to see how big this, men wearing rings thing, is. It started in the 16th century with some of the Kings and such but it is still going strong in the here and now. Men of all walks of life really like to sport finger candy! Tattoo’s and rings, tuxedos and rings, surfboards and rings, motorcycles and rings, rings and rings! Fashion wise, men are kind of smashing it in general right now. London Fashion Week Men’s 2018 has been described as having been creative, uplifting, extraordinary and fun, fun, fun. It’s time to play again and lighten up a bit. Men's rings are rings designed for men. Meaning to match a man's style and build, which at this point is pretty darn fluid and non-binding. You can express your manly side one day and your peace-loving BoHo side next all through style leading with a statement ring. According to the Art of Manliness, each finger has a symbolic meaning. Of course, wedding bands are placed on the left-hand fourth digit, right? The smart men’s blog, reveals that there are many societies and cultural traditions which differ from the British and American standard left-handed wedding ring placement, including Northern and Easter European countries like Bulgaria; Denmark, Greece, Norway, Poland, Portugal, Russia, and Spain to name a few. So, that tradition is not universal. Basic ring placement ‘rules’ seem to be, the pinky finger for statement rings; the index finger has historically been the power or status finger, often used in affiliation with a team, club or society, and the middle finger represents structure and balance. The bottom line is whichever finger you find most comfortable and preferred, is always the right ring baring choice. 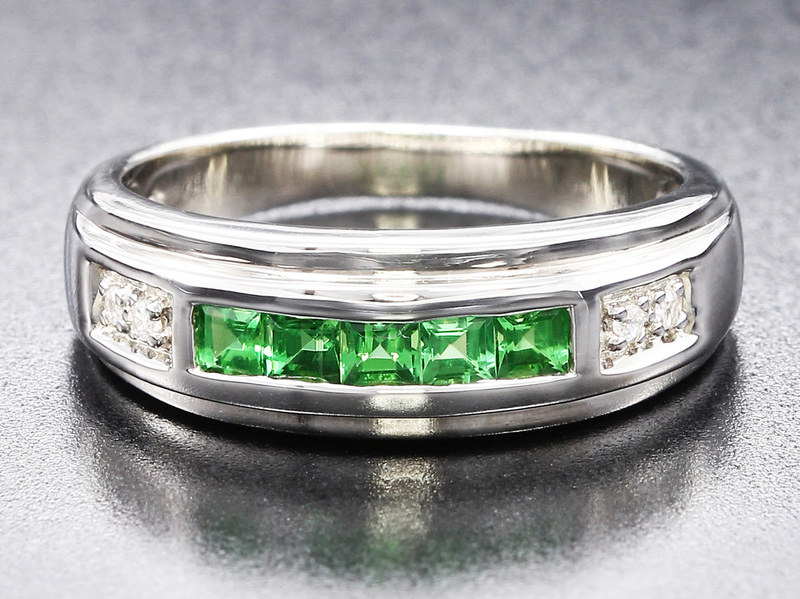 At Rocks & Co. our Men's Rings can help add panache to your look! Today's men are increasingly expressing their own personal style. With Rocks & Co. men's rings, you can certainly find .925 Sterling Silver and 9K Gold rings. As you can see for yourself, we have a large selection of men's rings to choose from, all designed with stones from our amazing gem collection including Amethyst; Diamond, Garnet, Moonstone, Quartz, Sphene Topaz, and Zircon. Men have been wearing rings at least since the time of the Egyptian Pharos. Ring origin is controversial, with competing discoveries of the ‘oldest’ ring creation. An older ring keeps turning up and out olding the one before it. Men historically have worn rings to show membership of a team, society or royal family affiliation in addition to state relationship status and for style right up to present day. As a tip of the old chapeau to the British tradition, President Franklin D. Roosevelt was known to wear a signet ring. This was inherited from his father James, originating with FDR’s grandfather. All three generations wore the signet on top of their wedding bands, on their left pinkies. Did you ever wonder where the tradition of wearing a signet ring on the pinky finger came from? Style in general ad rings specifically seems to be a uniting force, at least in terms of the love of style style amongst the Royals, Dandies & Gangsters. One digit stands out in this regard. The manly pinky fingers! The love of a pinky ring is an ongoing true romance. Pinky rings have been a thing across class lines for quite some time. So, as we know use of the left pinky finger for men’s wedding rings and signets rings is an embedded royal tradition. The tradition leads back to Queen Victoria and her sons. Victoria’s sons wore them, as did their mother in addition to being influenced by the German custom. Notably King Leopold. Interestingly in the Victorian era men and women wore pinky rings to show that they were single, available and not interested in marriage. Elvis was known as the king of Rock & Roll but as well as the Prince of baubles. He loved jewelry and would wear many rings at a time and would give them away to his women, entourage and even fans as quickly as he commissioned them. Elvis had a love for Opal rings and one of his favorites was a 14 K Gold ring with an Emerald cut opal with forty diamonds surrounding the opal Halo style. With the support of men's fashion designers, lifestyle influencers and bloggers, men are quickly catching up with women in the worlds of self-care; fashion, and style so of course men's rings of Sterling Silver and Gold are in the mix. Whatever finger you sport your ring on, and for whatever reason, it's really up to you. What feels comfortable is what is right!